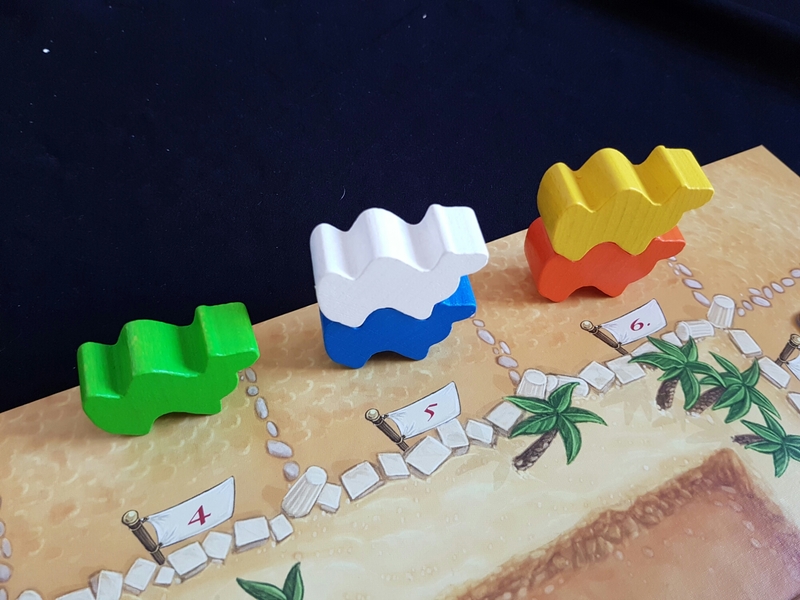 Posted on December 14, 2016 by thelostlighthouse	in 2-8 players, Board Games, Gaming and tagged board game, camels, dice, eggertspiele, family friendly, pegasus spiele, spiel des jarhres 2-8 players. Welcome back you lovely people! As the most wonderful time of the year is nearly upon us, we have another great game that will have the whole family at the races and hopefully not leave anyone with the hump. 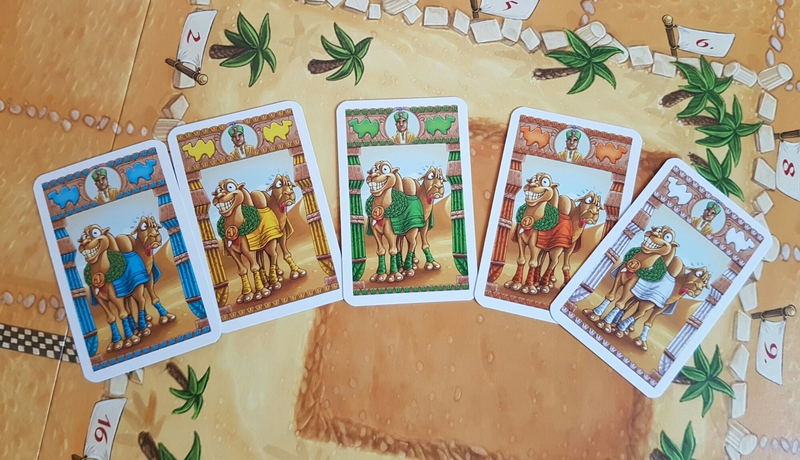 Camel up is a betting game designed by Steffen Bogen. With only a couple of pages of quick to learn rules, it really packs in lots of fun. With a 20-30 minutes game length (definitely more on the 20 minute mark, even less with experienced players) you won’t have to worry about family members getting board or delaying their post turkey power nap. 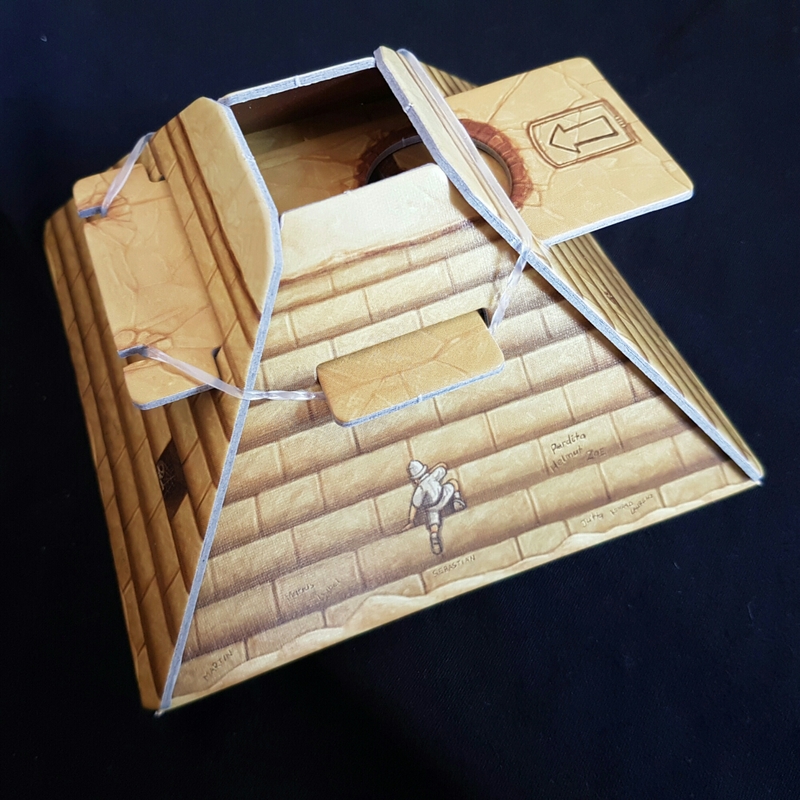 It also has an awesome pyramid that holds all the dice! I love it, it’s quite funny when everyone is waiting on the dice and nothing comes out. A quick shake helps that. 1. Take a betting slip. By doing this you are saying that you think the camel you chose is going to win the leg. The earlier you take a slip, the bigger the earner if it wins. Although if it comes second you still get a pound but you’ll lose a pound if it’s in the last 3. 2. Place your desert tile. 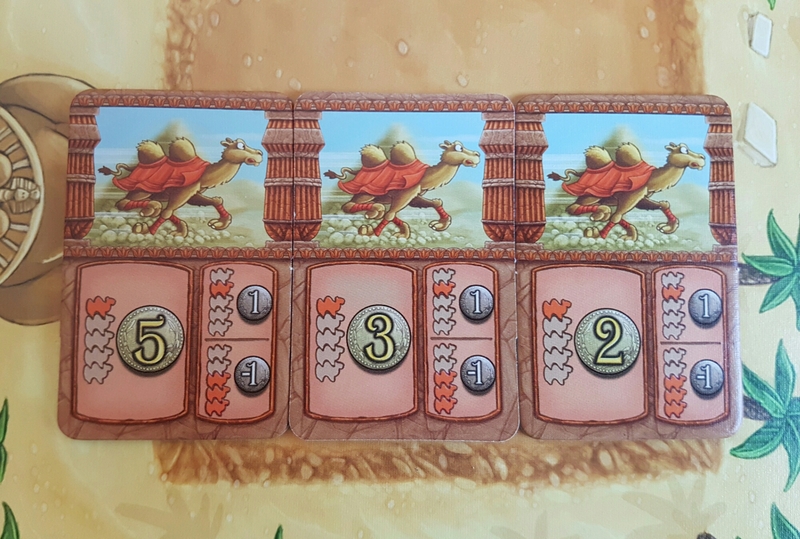 Each player gets a double sided desert tile. By placing this you can make a camel that lands on it go a space further or back. A well placed desert tile can cause havoc for people and is a really great move that a lot of players miss. 3. Take a pyramid tile and move a camel. A pyramid tile means you’ll get a pound at the end of the leg but also means you get to shake the dice pyramid! Which is one of the most fun elements for me but I am a massive child. Each camel has a same coloured dice that is numbered 1-3. Once it’s revealed you move that camel that distance. 4. Bet on the overall winner or loser. You can place one of your betting cards on the overall winner or loser pile. This is for the lap not the leg. Once all the camels have moved the leg ends and you work out how much each person has won and or lost, refill the dice pyramid (what a fun phrase) and start the next leg. Who ever ends the game with most money wins the game. Nice and simple. The biggest strength of Camel up is how the camels move. It’s really cool. 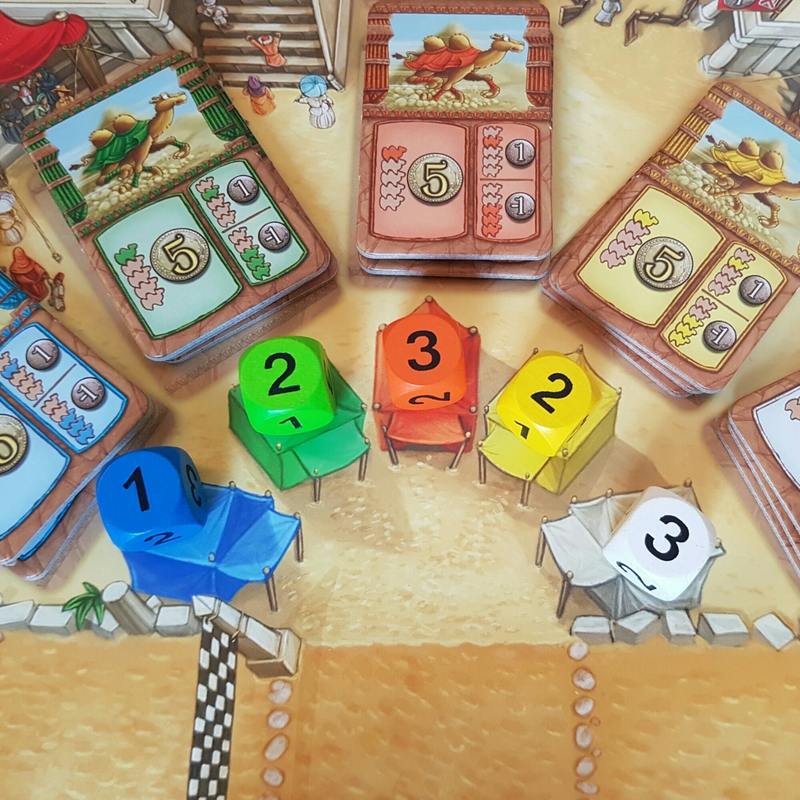 As they make their move, according to dice rolls, they inevitably end up landing on the same space as another camel, but you don’t just stand them next to each other, you stack them on top! It’s even worse when a camel is moved back because of a desert tile, it goes to the bottom of the stack if there’s one on the space behind it. If there is a stack, the camel on top is considered to be in the lead of the rest. Another awesome thing is if a camel in the stack moves, it takes any on top of it with it! This results in some risky bet taking and really makes it a stand out game. No wonder it won the Speil Des Jahres in 2014. Yellow is in the lead…I think. 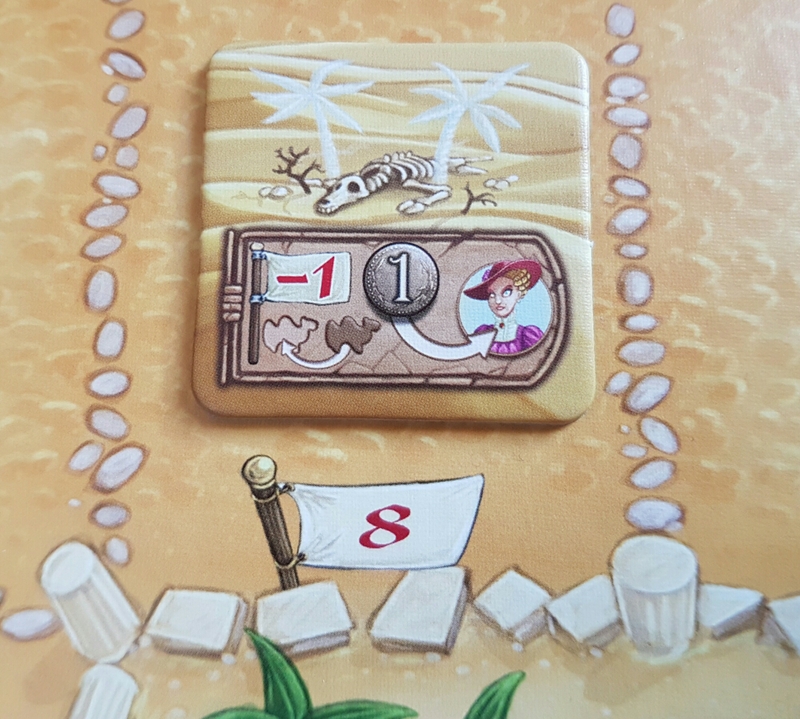 I really enjoy Camel Up as a light-hearted, non serious game. At an RRP of £27.99 it’s a little higher than I’d hope but with the recent decisions our country has taken, a lot of games have a higher price tag. Any “hard-core” gamers may need to warm to it as it’s not really got any strategy per say but it requires some ballsy moves (and a lot of luck) to take a decisive lead. I’ve only played between 3-5 players and it has scaled up well. Haven’t tried 8 yet. So send someone some cheers this Xmas with Camel Up. Did I mention it has a dice pyramid? !